a vision of India's futuristic advancement. The growing profile of India has necessitated the need to energize interaction at the highest levels with other countries. Correspondingly, the President has received several Head of State and Government from all the regions of the world, in line with India’s foreign policy of engagement with key countries on issues of bilateral, regional, and international importance. These visits, both outgoing and in-coming, have generated tremendous goodwill and contributed to cementing the strategic relationships that India has created with these countries and within wider frameworks such as G-20, SAARC, BRICS, ASEANEAS and ISBA. The key dignitaries received by her at the Rashtrapati Bhavan included Head of Stated from G-5 nations (US, Russia, France, Germany and UK ), BRICS nations (Brazil , South Africa), SAARC nations (Sri Lanka, Nepal, Bhutan, Bangladesh), ASEAN, Africa, Europe, Middle east and Central Asia nations. The visit of a Head of the State to the Rashtrapati Bhavan includes ceremonial Guard of Honour in the foyer, followed by bilateral discussions between the two head of states and a banquet in the evening. Click for details of Presidential banquet speeches. One of the most important initiatives taken by her as President on foreign visits was emphasis on promoting trade and business ties with each country she visited. Business delegations, on their own, facilitated by Indian chambers of commerce accompanied the President on her overseas visits. A serious effort was made to encourage business delegations to expand ties with counterparts in sectors that were identified in advance as having potential to generate opportunities for Indian business and industry. In every country visited by her she insisted on knowing from the local Indian business community as well as Indian companies having experience in that market, of the problems and concerns that they faced so as to work out remedial measures. Issues causing impediments in the way of trade of a serious nature that warranted intervention at the highest level were discussed. 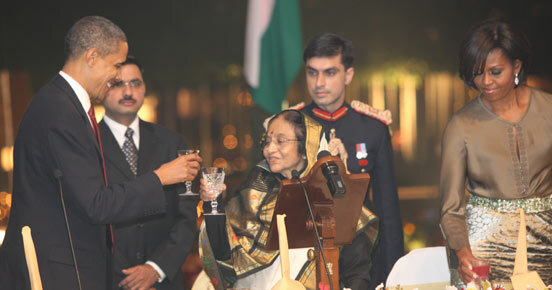 She never hesitated as President to take up issues of concern of the Indian business community with her counterparts. As President, she made 13 State visits comprising 24 countries. Business delegations visited 21 countries during her State Visits. The representation in the Business Delegations was from diverse sectors and the number of delegates went up from 18-20 persons in the initial visits, to around 40-50 in later visits and in all, 492 representatives were part of such delegations. The visits resulted in signing of MoUs between Indian business houses and host country counterparts. The delegation level and one-to-one meetings which were held as part of the Presidential State visits helped in removing bottlenecks, clearing apprehensions and identifying fresh avenues for new and mutually beneficial economic activities and people to people contacts. On her initiative, the three Business Chambers, ASSOCHAM, CII & FICCI by turn, took the lead in organizing visits of the delegations to different countries during her State Visits. The three chambers compiled the achievements and outcomes of these visits in a compendium titles “Engaging the World” and jointly presented it to her as the President on June 18, 2012. Speaking on the occasion, Shri D.S.Rawat, Secretary General, ASSOCHAM, said that the President’s initiatives for taking Indian business representatives in delegations abroad ‘gave them a unique exposure at the highest levels in the host countries’. While expressing gratitude to her as President, Shri Chandrajit Banerjee, Director General, CII, spoke about ‘the unique leadership that we saw in Smt. Pratibha Patil, in taking industry along and exposing them at the highest level in several countries and really increasing our exposure and our share in the global economy’. Dr. Rajiv Kumar, Secretary General, FICCI, said that the compendium is a summary of what the President has achieved in these five years, on behalf of the Indian industry, and how the President helped them in taking industry forward.